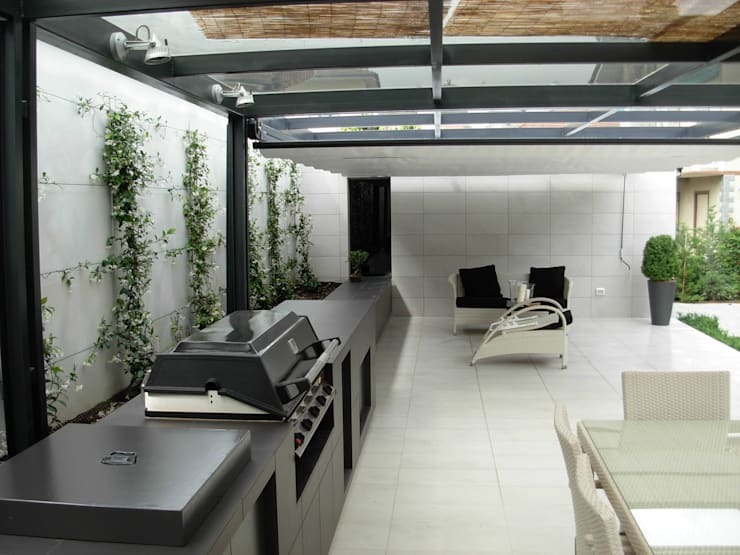 One of the best ways to get yourself outdoors and enjoying your balcony, terrace or garden, is by installing a great outdoor grill or kitchen. It provides a focus for guests and will act as a social lubricant as everyone pitches in to help (if that's your kind of thing, of course!). 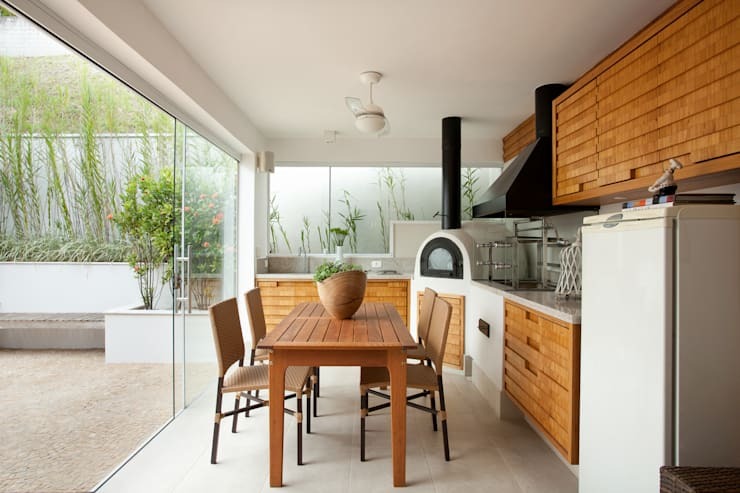 So what are the types of outdoor kitchen you might create? Well, today we present a collection that comes from all corners of the world. Let's check them out! This country-style outdoor kitchen is decked out with everything you might need. There's a huge eating area and lots of facilities. The best thing here is the rustic theme. Exposed brick, an autumnal colour palette and lots of wooden elements are a key part of this look. 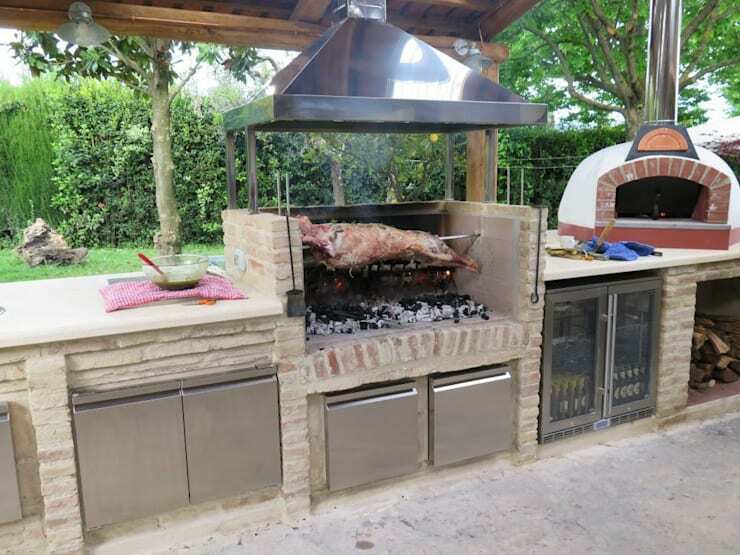 This outdoor kitchen looks a bit more like your typical outdoor grill or barbecue setup. The black steel material is very easy to clean and perfect for those who like a more casual approach to entertaining. The design also adds to the modern, slick look of the monochromatic entertaining area. 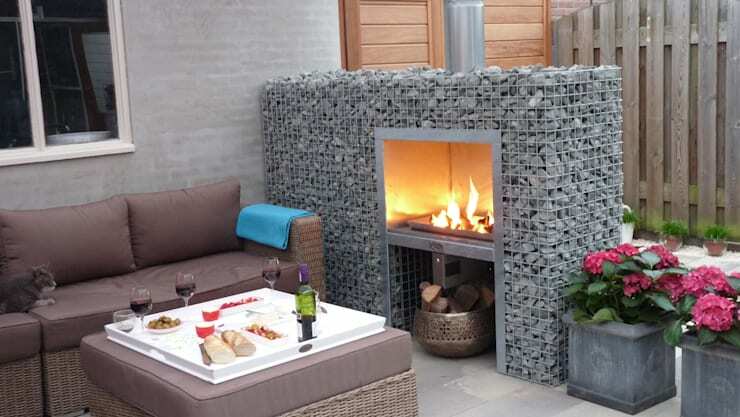 An open grill or fire adds a very attractive and cosy appeal to an outdoor entertaining area. It will draw your guests around and ensure that cooking becomes a real social point. But the safety issues really need to be considered. This kind of setup really does need a hood or shield to account for stray flames on windy days. But perhaps you could install something like this! It's stylish and totally unique. We love the compact nature of this outdoor grill. It also has an attached bar-style bench so it can easily be relocated when needed. This would be perfect for those who want to follow the movements of the sun or just hunker down under the shade when it's too hot. 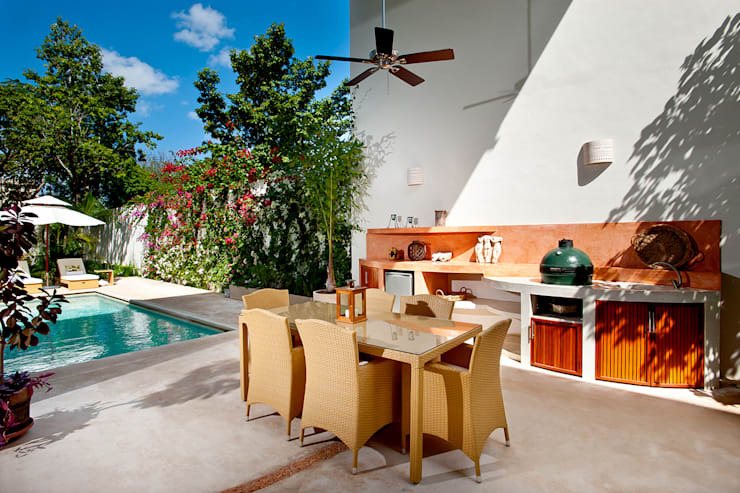 This very appealing Spanish outdoor entertaining area has a big, bright, colourful and breezy style. How do they do it? Well, it's a combination of super high ceilings, a low-set rustic style kitchen and lots of big trees. Note the hardy, simple concrete bench around the outdoor grill too. Simplicity is sometimes the best approach. 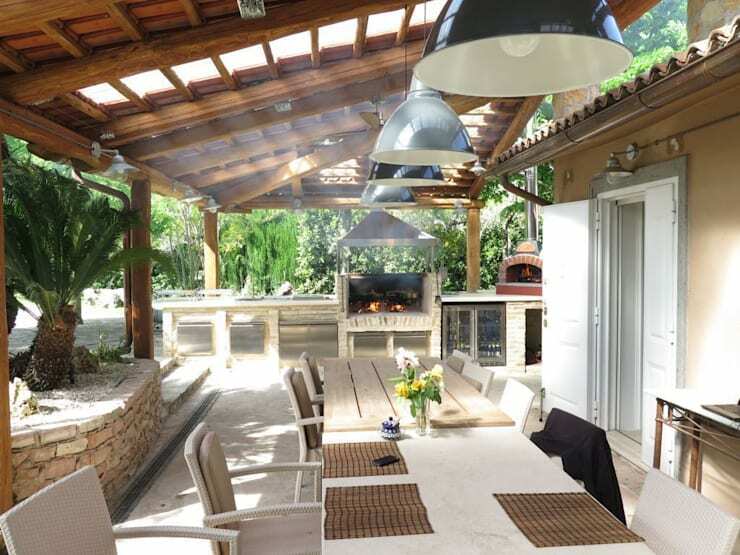 This big rustic style outdoor kitchen is certainly built for entertaining a lot of people. If you are planning to cook lots of meat, seriously consider a good exhaust hood like this to contain the smells. 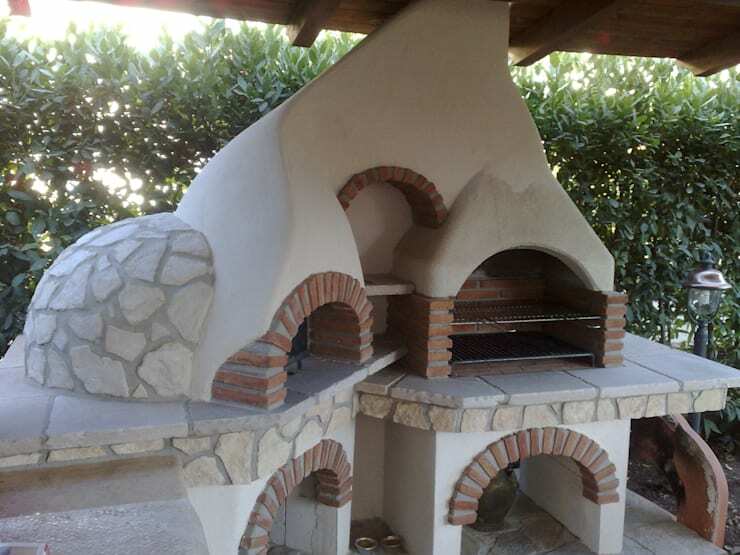 This clay-baked oven from the same home comes with the luxurious option of a second oven. This kind of oven has a thick insulation layer, so it can take a while to get fired up, but once you do the heat will last for hours. It also, just happens to be the perfect type of outdoor grill if you love the rich delicious taste of slow-cooked food. And here we see the above two grills in their wider setting. This kind of arrangement is perfect for those with large sprawling families or lots of younger children. 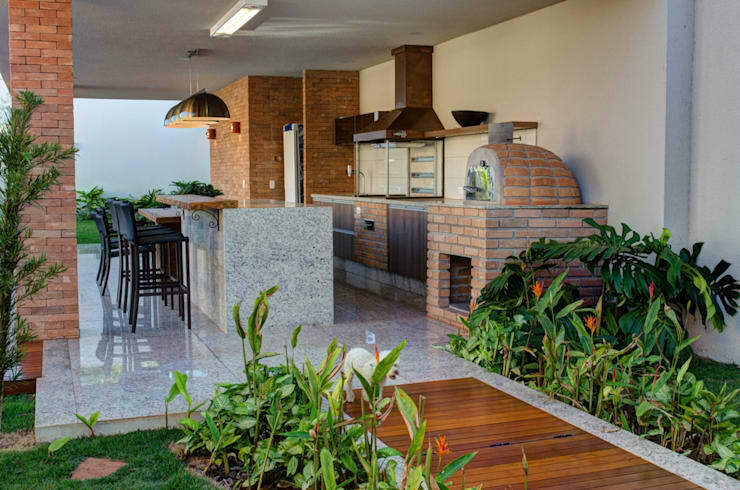 Some readers are sure to fall in love with this fresh, crisp outdoor kitchen. The combination of white surfaces and caramel timber cabinet doors creates a perfectly appealing contrast of colours. The other appealing element here is the sharp contrast between the chunky wooden furnishings and the cool, minimalist lines of the glass walls. Finally, check out the little wood fired oven in the corner. 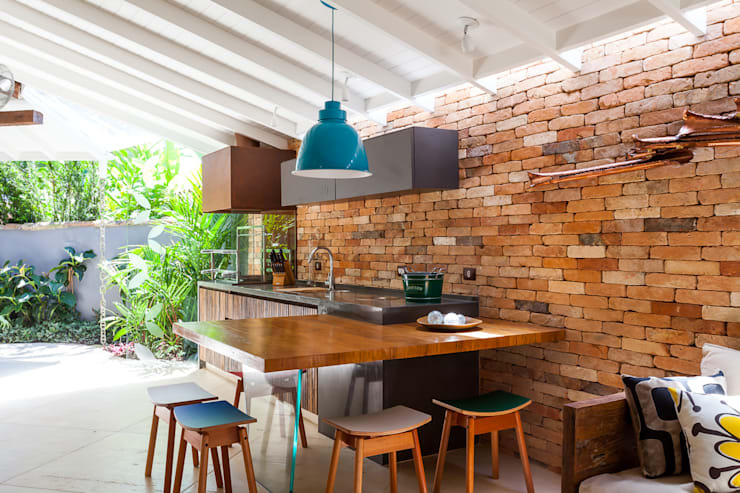 A single wall of exposed bricks goes a long way towards setting a rustic theme. 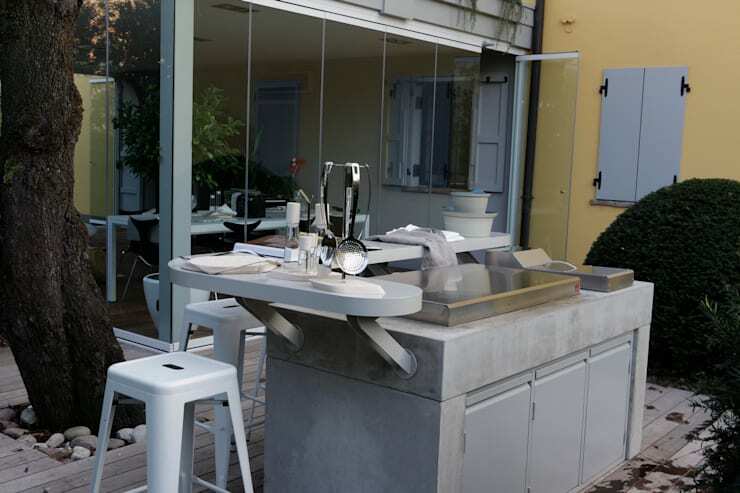 You don't need to get overly formal with an outdoor kitchen, so just some simple stools like this should suffice. It's easy to get caught up in decking out your terrace with high-tech kitchen accessories, but they should never dominate the design. 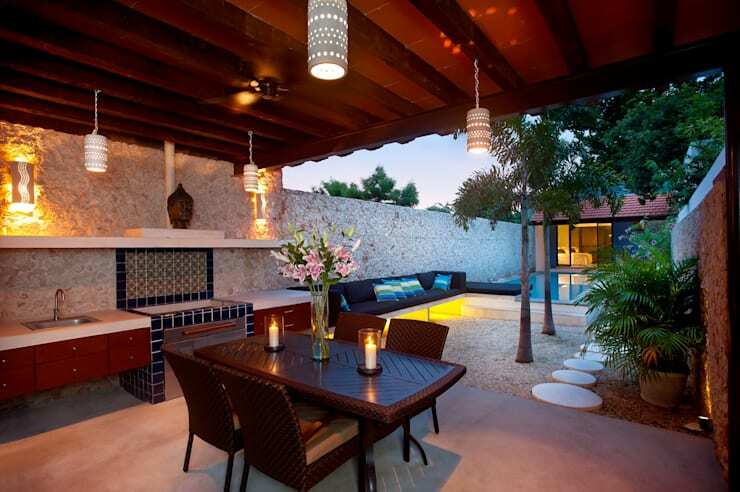 This outdoor oasis shows just how the furnishings and wall treatments can be too. For more home inspiration, have a look at 12 ways to add texture to your walls. What do you think of the outdoor kitchens we've presented today?